When I spoke here, three years ago, Israel stood alone among the nations. 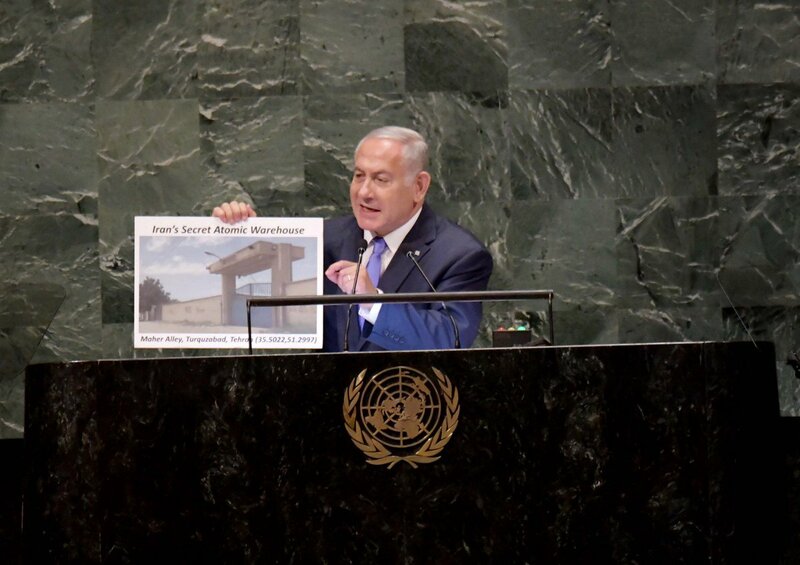 Of the nearly 200 countries that sit in this hall, only Israel openly opposed the nuclear deal with Iran. We oppose it because it threatens our future, even our very survival. We oppose it because the deal paved Iran’s path to a nuclear arsenal. And by lifting the sanctions, it’s fueled Iran’s campaign of carnage and conquest throughout the Middle East. We oppose it, we oppose it because the deal was based on a fundamental lie—that Iran is not seeking to develop nuclear weapons. Now, Israel exposed that lie earlier this year. Last February, Israeli conducted a daring raid on Iran’s secret atomic archive. We obtained over 100,000 documents and videos that had been stashed in vaults in an innocent looking building in the heart of Tehran. In May, I presented a short summary of what we obtained to the international media. I provided hard evidence of Iran’s plans to build nuclear weapons and its plans to deceive the international community. Israel shared this information and even more damning evidence that we found with members of the P5+1, and with the International Atomic Energy Agency. Months have passed. The IAEA has still not taken any action. It has not posed a single question to Iran. It has not demanded to inspect a single new site discovered in that secret archive. So, given this inaction, I decided to reveal today something else that we have shared with the IAEA and with a few intelligence agencies. What I’m about to say has not been shared publically before. Today, I am disclosing for the first time that Iran has another secret facility in Tehran—a secret atomic warehouse for storing massive amounts of equipment and materiel from Iran’s secret nuclear weapons program. In May, we exposed the site of Iran’s secret atomic archive, right here, in the Shor-abad District of Tehran. Today I’m revealing the site of a second facility— Iran’s secret atomic warehouse. It’s right here, in the Turquz-abad District of Tehran, just there miles away. Let me show you exactly what the secret atomic warehouse looks like. Here it is. You see, like the atomic archive, it’s another innocent looking compound. Now for those of you at home using Google Earth, this no-longer-secret atomic warehouse is on Maher Alley, Maher Street. You have the coordinates, you can try to get there. And for those of you who try to get there, it’s 100 meters from the Kalishoi, the rug cleaning operation. By the way, I hear they do a fantastic job cleaning rugs there. But by now they may be radioactive rugs. This is the second secret site. Now, countries with satellite capabilities may notice some increased activity on Maher Alley in the days and weeks ahead. The people they’ll see scurrying back and forth are Iranian officials desperately trying to finish the job of cleaning up that site. Because, you see, since we raided the atomic archive, they’ve been busy cleaning out the atomic warehouse. Just last month, they removed 15 kilograms of radioactive material. You know what they did with it? They had 15 kilograms of radioactive material, they had to get it out of the site, so they took it out and they spread it around Tehran in an effort to hide the evidence. The endangered residents of Tehran may want to know that they can get a Geiger counter on Amazon for only $29.99. As of today that’s just 4 million Iranian rials, but we’ll get to that later. I’ll talk about the Iranian economy in a minute. They took this radioactive material and spread it around Tehran. Now, the Iranian officials cleaning out that site still have a lot of work to do because they’ve had at least, at least 15 ship containers, they’re gigantic, 15 ship containers full of nuclear related equipment and material stored there. Now, since each of those containers can hold 20 tons of material, this means that this site contains as much as 300 tons, 300 tons of nuclear related equipment and material. You have to ask yourself a question. Why did Iran keep a secret atomic archive and a secret atomic warehouse? Because, after all, when South Africa and Libya, when they gave up their nuclear programs, the first thing they did was to destroy both the archives and the material and equipment. And the answer to the question is simple. The reason Iran didn’t destroy its atomic archive and its atomic warehouse is because it hasn’t abandoned its goal to develop nuclear weapons. In fact, it planned to use both of these sites in a few years when the time would be right to break out to the atom bomb. But, Ladies and Gentlemen, rest assured, that won’t happen. It won’t happen because what Iran hides, Israel will find. I have a message to the head of the IAEA, Mr. Yukiya Amano. I believe he’s a good man. I believe he wants to do the right thing. Well, Mr. Amano, do the right thing. Go inspect this atomic warehouse, immediately, before the Iranians finish clearing it out. Do you remember when we were promised that inspections could take place anytime, anywhere? Remember that? Anytime, anywhere? Well, how about inspections right here, right now. And Mr. Amano, while you’re at it, inspect the other secret sites we told you about. Once and for all, tell the world the truth about Iran. Israel knows what you’re doing, and Israel knows where you’re doing it. Israel will never let a regime that calls for our destruction to develop nuclear weapons. Not now, not in ten years, not ever. And Israel will do whatever it must do to defend itself against Iran’s aggression. We will continue to act against you in Syria. We will act against you in Lebanon. We will act against you in Iraq. We will act against you whenever and wherever we must act to defend our state and defend our people. Three years ago, a few weeks after the nuclear deal was completed, I asked this question from this very podium: Does anyone seriously believe that flooding Iran’s radical theocracy with weapons and cash will curb its appetite for aggression? But many of the deal’s supporters believed just that. They believed that Iran’s regime would become more moderate, more peaceful. They believed that Iran would use the billions of dollars it received in sanctions relief to improve the lives of its people—to solve the water problem, to solve the trucking problem, to solve the electricity problem, hospitals, schools… That’s what they believed, and perhaps many of you also believed that. Instead, Iran used the money to fuel its vast war machine. Just this past year, Iran has attacked Kurds in Iraq, slaughtered Sunnis in Syria, armed Hezbollah in Lebanon, financed Hamas in Gaza, fired missiles into Saudi Arabia, and threatened freedom of navigation in the Straits of Hormouz and the Strait of Bab al Mandeb. And if you think, if you think that Iran’s aggression has been confined to the Middle East, think again. Last month, two Iranian agents were arrested for plotting terror attacks right here in the United States. And several weeks ago, Iranian agents were arrested for plotting terror attacks in the heart of Europe. Yet while the United States is confronting Iran with new sanctions, Europe and others are appeasing Iran by trying to help it bypass those sanctions. Now I just used a word, a tough word, a very strong word—appeasement, and I use it reluctantly, but unfortunately, that’s exactly what we are seeing again in Europe. Think about this: The same week Iran was caught red-handed trying to murder European citizens, European leaders were rolling out the red carpet for President Rouhani, promising to give Iran even more money. I’m an historian’s son, I have to ask. I ask not merely as an historian’s son, I ask it as a Jew, as a citizen of the world, as someone who’s lived through the 20th century: Have these European leaders learned nothing from history? Will they ever wake up? Well, we in Israel, we don’t need a wakeup call, because Iran threatens us every day. Because despite the best of hope, and there were many hopes around the nuclear deal, this deal did not push war further away. It brought war ever closer to our borders. In Syria, Iran is trying to establish permanent military bases against us and has already launched missiles and drones into our territory. In Gaza, Iran is arming terror groups to launch rocket attacks into our cities and terror attacks against our civilians. In Lebanon, in Lebanon Iran is directing Hezbollah to build secret sites to convert inaccurate projectiles into precision guided missiles, missiles that can target deep inside Israel within an accuracy of ten meters. Hezbollah, listen to this, Hezbollah is deliberately using the innocent people of Beirut as human shields. They have placed three of these missile conversion sites alongside Beirut’s international airport. Here’s a picture that’s worth a thousand missiles. Here’s the first missile site. It’s in the Ouzai neighborhood on the water’s edge, a few blocks away from the runway. Here’s the second site. It’s underneath a soccer stadium, that’s the soccer stadium, two blocks way. And here’s the third site. It’s adjacent to the airport itself, right next to it. So I also have a message for Hezbollah today: Israel knows, Israel also knows what you’re doing. Israel knows where you’re doing it. And Israel will not let you get away with it. Just as the nuclear deal supporters were wrong about what would happen when sanctions would be removed, they were wrong, dead wrong, about what would happen when sanctions would be restored. They argued that US sanctions alone would have little impact, little economic impact on Iran. That’s what they said. Really? Well, let’s see what happened to Iran’s economy now that President Trump has forced companies to choose between doing business with Iran and doing business with the United States, whose GDP is 50 times the size of Iran’s GDP. A year ago, Iran’s economy was booming. Now it’s collapsing. Iran’s currency is plummeting. Inflation and unemployment are soaring. British airlines, German banks, French oil companies, Japanese oil importers and many others are scrambling to get out. If that’s little economic impact, imagine what will happen with the next batch of US sanctions imposed in November. The deal’s supporters were also wrong when they argued, you have to believe that they argue this. We’re going to have many arguments with them. They also argued that restoring sanctions would rally the Iranian people around the regime. Well, they’re definitely rallying, but not around the regime. They’re rallying against the regime. They’re not chanting Death to America. They’re chanting Death to the Dictator. They’re not chanting Export the Islamic Revolution. They’re chanting Leave Syria! Leave Lebanon! Leave Gaza! Take care of us in Iran! I listen to these protests. I talk to the Iranian people. I issue these videos and I get so many responses from Iranians. At first I thought these are Iranian exiles in the safety of London or Paris or Los Angeles. No. Iranians, from Iran embracing Israel, criticizing the regime. That’s an understatement. With their names. And I ask my intelligence people, what’s going on. And shortly after the protests broke out, not because of what I said, but it was an indicator of something extraordinary that was taking place there. Because in these protests, the Iranian people are showing unbelievable courage. the people of Iran are bravely standing up to a regime that has brutally repressed them for four decades and that has squandered their money, still squanders their money in bloody wars across the Middle East. So here’s what I say to Europe’s leaders and to others: Instead of coddling Iran’s dictators, join the US, and Israel, and most of the Arab world in supporting new sanctions against a regime that endangers all of us and all of the world. Israel is deeply grateful to President Trump for his bold decision to withdraw from the disastrous nuclear deal with Iran. Many, many of our Arab neighbors are also grateful. And everyone who cares about the peace and security of the world should also be grateful. But, Ladies and Gentlemen, I have an important confession to make. This may surprise you, but I have to admit that the Iran deal has had one positive consequence, an unintended one, but a positive consequence. By empowering Iran, it brought Israel and many Arab states closer together than ever before, closer together than ever before, in an intimacy and friendship that I’ve not seen in my lifetime and would have been unimaginable a few years ago. And you know, when you form friendships around a threat, around a challenge, you quickly see opportunities, not only for security, but how to bring a better life for our people which Israel can help and wants to help do. Israel deeply values these new friendships, and I hope the day will soon arrive when Israel will be able to expand peace, a formal peace, beyond Egypt and Jordan to other Arab neighbors, including the Palestinians. I look forward to working with President Trump and his peace team to achieve that goal. I also want to use this opportunity, we’re here at the UN—it’s a place I know because I served here as ambassador many years ago for many years, so I know something about the UN. So I want to use this opportunity to express Israel’s appreciation to President Trump and Ambassador Haley for the unwavering support they have provided Israel at the United Nations. They have unequivocally backed Israel’s right to defend itself. They rightly pulled out of a history-denying UNESCO and a morally bankrupt UN Human Rights Council. They have more resolutions about Israel than the rest of the world combined, I think. And tenfold compared to, I don’t know, Iran, Syria, you name it. Not even tenfold, because you can’t multiply zero by any number. They stopped funding, President Trump and Ambassador Haley, they stopped funding an unreformed UNRWA, an organization that instead of solving the Palestinian refugee problem, perpetuates it. Day after day, the Trump administration has stood up to what has long been a specialty here at the UN—slandering Israel. Even though the shameful resolution comparing Zionism to racism was repealed 25 years ago, I’m sorry to say that its foul stench still clings to these halls. Israel airlifted Ethiopian Jews to freedom and a new life in Israel, in the Jewish state. Yet here at the UN, here at the UN, Israel is absurdly accused of racism. Israel’s Arab citizens vote in our elections, serve in our parliament, preside over our courts, and have exactly the same individual rights as all other Israeli citizens. Yet here at the UN, Israel is shamefully accused of apartheid. Today, there are at least five times as many Palestinians as there were in 1948, the year of Israel’s founding. Yet here at the UN, Israel is outrageously accused of ethnic cleansing. Ladies and Gentlemen, you know what this is? It’s the same old antisemitism with a brand new face. That’s all it is. Once, it was the Jewish people that were slandered and held to a different standard. Today, it’s the Jewish state that is slandered and held to a different standard. Here’s an example: Take the outlandish attacks that have been leveled against Israel after our Knesset, our parliament, recently adopted a law declaring Israel the nation state of the Jewish people. Mind you, Israel is a free country. You can oppose a law, and people did. You can call for different wording in this or that clause, or you can call to add or subtract a clause. You can do that. But when Israel is called racist, Israel is called racist for making Hebrew its official language and the Star of David its national flag, when Israel is labeled an apartheid state for declaring itself the nation state of the Jewish people, this is downright preposterous. And you know why? Because represented in this hall today are more than 100 countries that have only one official language, even though many other languages are commonly spoken within those countries. There are more than 50 countries here that have crosses or crescents on their flags, even though they have many non-Muslims and non-Christians, many of them, living in their midst. And there are dozens of countries that define themselves as nation states of a particular people, even though there are many ethnic and national minorities within their borders. None of those countries are denigrated or libeled for celebrating their unique national identity. Only Israel is denigrated. Only Israel is libeled. What is unique about the Jewish people is not that we have a nation state. What is unique is that many still oppose us having a nation state. Moments ago, President Abbas outrageously said that Israel’s Nation State Law proves that Israel is a racist, apartheid state. 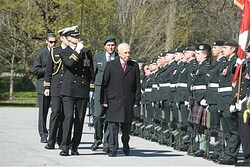 President Abbas, you should know better. You wrote a dissertation denying the Holocaust. Your Palestinian Authority imposes death sentences on Palestinians for selling land to Jews. Did you hear that? If a Jew buys an apartment, a piece of land anywhere in the Palestinian territories, the Palestinian who sold him that land is executed. That’s what the law says. President Abbas, you proudly pay Palestinian terrorists who murder Jews. In fact, the more they slay, the more you pay. That’s in their law too. And you condemn Israel’s morality? You call Israel racist? This is not the way to peace. This is not the way to achieve the peace we all want and need and to which Israel remain committed. This body should not be applauding the head of a regime that pays terrorists. The UN should condemn such a despicable policy. And the UN, the UN which brokered a ceasefire in 2014, should demand that Hamas release our fallen soldiers Oron Shaul and Hadar Goldin, who was kidnapped when Hamas violated that very ceasefire. Hamas should also release the two Israeli citizens it holds captive, Abera Mengistu and Hisham al Sayed. Every time I stand here, I feel as I do today. I am privileged to stand here as the Prime Minister of the Jewish and democratic state of Israel. Some believe that Israel cannot be both Jewish and democratic. This is false. Israel is both, and Israel will always remain both. Ever since Abraham and Sarah made their journey to the promised land nearly 4,000 years ago, the Land of Israel has been our homeland. It’s the place where Isaac and Rebecca, Jacob, Leah and Rachel carried on their eternal covenant with God. It is where Joshua made us a sovereign nation, where David ruled and Isaiah preached, where the Maccabees fought and where Masada fell. It is the place from which we were exiled and to which we returned, rebuilding our ancient and eternal capital Jerusalem. The nation state of Israel is the only place where the Jewish people proudly exercise our collective right of self-determination. That right was recognized nearly a century ago by the League of Nations and over 70 years ago by the United Nations, when it voted to support the establishment of a Jewish state. That’s what it said, that resolution—a Jewish state. At the same time, Israel is a vibrant democracy, where all its citizens—Jews and non-Jews alike—enjoy equal individual rights, and these rights are guaranteed by law. In Israel, whether you are a Jew or an Arab, a Christian or a Muslim, a Druze or a Beduin, or anything else, your individual rights are exactly the same, and they will always remain the same. In the Middle East, that’s not obvious, now that’s an understatement, In the Middle East, where women are often treated as property, minorities are persecuted, gays are hanged, Israel stands out as a shining example of freedom and progress. I could not be more proud to represent my country Israel. I am proud that we’ve made Israel a global technological power of breathtaking creativity, in information technology, in precision agriculture, you know what that is? We target the fertilizer and the water down to the individual plant, not field, not part of a field, down to the plant. I’m proud of these geniuses, that bring these unbelievable developments, in water management, in cyber security, in autonomous vehicles, in digital health, in medical devices and in so many other fields that are improving the lives of billions of people around the world. I am proud of Israel’s brilliant scholars, innovative entrepreneurs and talented artists. I am proud of Israel’s devoted teachers, compassionate doctors, and our search-and-rescue teams who save lives from Haiti to Mexico, from Nepal to the Philippines. I am proud, I am so proud of Israel’s courageous soldiers, the men and women who bravely defend our homeland while upholding the highest values. 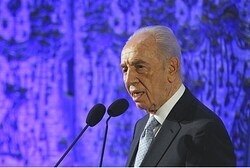 And most of all, Ladies and Gentlemen, Most of all I am proud of the people of Israel, who draw extraordinary strength from the deep wellsprings of our heritage, who possess an unbreakable spirit and who are determined as ever to build a secure and magnificent future for the one and only Jewish state.